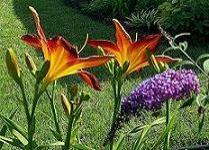 Butterfly garden designs include a kaleidoscope of color to attract these beautiful creatures to a garden area. By adding their favorite plants and flowers, providing a place to drink, and a couple of snack items, you'll soon be enjoying these winged visitors on a regular basis. Butterflies prefer cupped or trumpet-shaped flowers of any size. If you plan to include a butterfuly bush in the design, you'll need a good sized area. An area about 10 foot by 12 foot should do well. Also, you'll want to be sure the will receive full sun at least six hours a day. Butterflies prefer a ground level place to grab a drink. Sink a shallow dish into the ground. Place two or three dark rocks in the dish and fill the dish with water. The butterflies will be able to grab a drink or warm themselves from this area. You might set out a few pieces of banana or watermelon as a snack for the butterflies. Be sure to arrange a viewing area where you'll be able to quietly observe the butterflies without discouraging them from visiting and feeding on the flowers they like best. Because of the colorful flowers, butterfly gardens sometimes draw a surprise visitor. If you'd like to try to include a hummingbird feeder in the garden, you may be able to attract some of these winged beauties, also.